You may have heard me talking about my lack of hair-know-how in previous posts. I really don’t know a huge amount about it and have never really done much to my hair other than occasionally curl or straighten it and play around with various products that I think might help me to get the hair style I want. Although to be honest, even I’m not too sure what that is - my fine hair was always really easy to take care of until a couple of years ago when the split ends arrived. Hello frizz! Well, for the time being at least I have found a few products that gets my hair looking smooth. As I have said already, however, I am in no way a hair expert, and to be honest, even with these products, the behaviour of my hair still varies wash to wash and day to day. For now I’m happy with my hair routine and I want to share it with you. 1 - I tend to switch up the shampoo and conditioners that I use depending on what’s on hand (which happen to be the Tresemme Volume shampoo and conditioner right now). One thing that I always do when I get out of the shower, though, is spray my hair with heat protectant as I usually blow dry it. 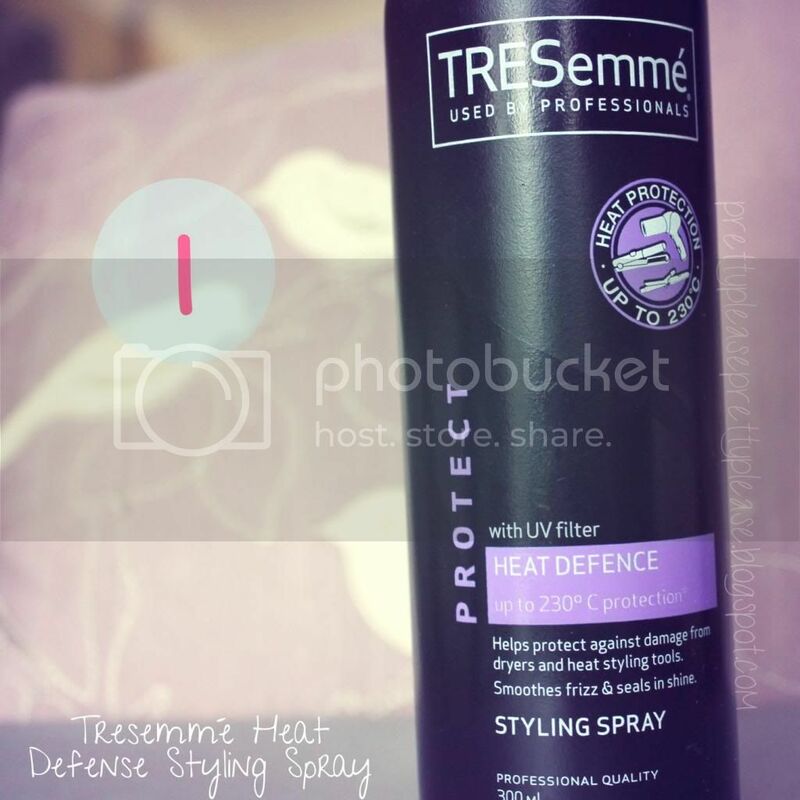 Again, I tend to use whatever appeals to me when I’m in Boots and I’d heard good things about the Tresemme Heat Defense Styling Spray. I’m not so sure about its claims to tame frizz and lock in shine, but this was £4.69 and I’ve been using it since September so it’s pretty fair value. 2 - This may seem crazy but I’ve only recently started using serum regularly and it’s made a big difference since my hair has been getting a little more frizzy whenever it fancies it (I know it really really need a trim!). 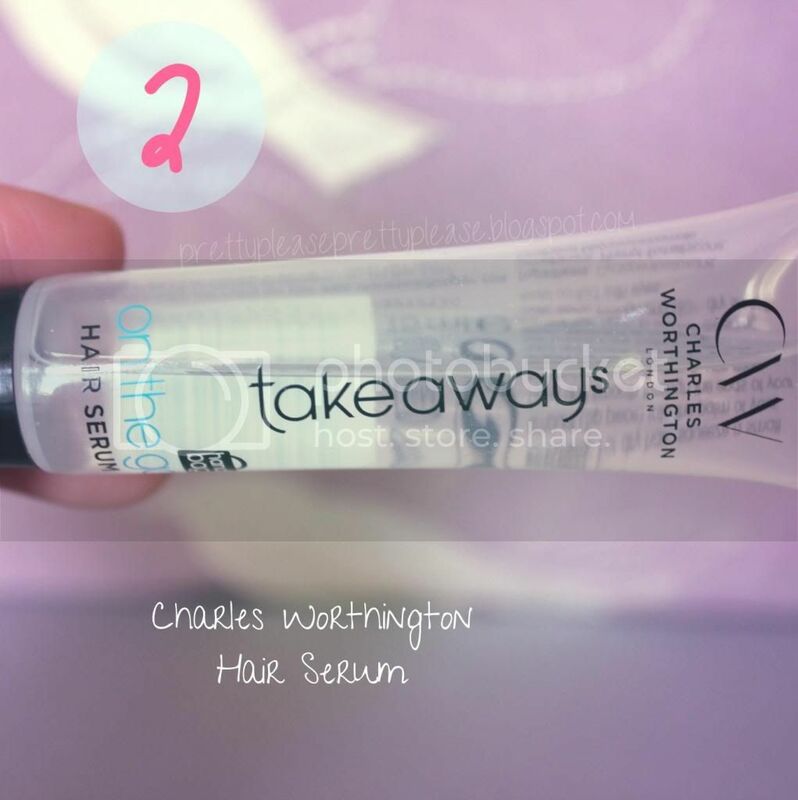 Anyway, although it’s only the first serum that I’ve used, I love the Charles Worthington Hair Serum, and despite its size it seems to be last a pretty long time. When I’ve just washed my hair I put a squirt of product about the size of a 10p piece into the palm of my hand, flip my head upside down and work it through my hair from just below mid-lengths to ends. The product doesn’t feel sticky, perhaps slightly oily but definitely not greasy (I’m not describing this very well, am I?). Next I comb all through my hair to disperse both products I’ve used so far. 3 - At this point I will begin blowdrying my hair - it is important to note that I have been using a pretty decent new hairdryer from Parlux and I always use the nozzle on it as it prevents flyaways and frizz (I also try to avoid putting it on full heat when I can). 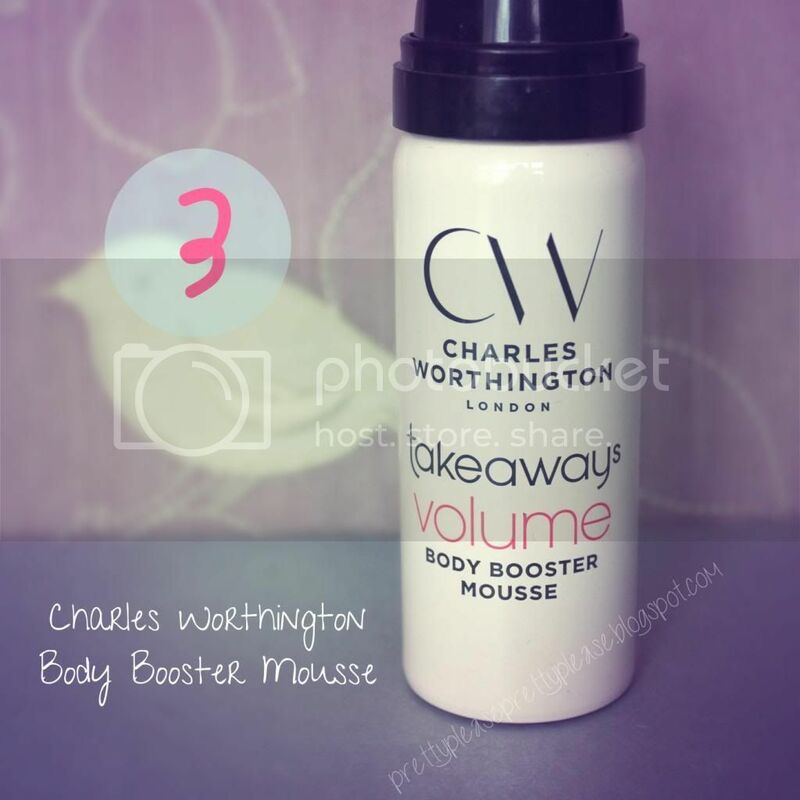 After about a minute of drying time I squirt a bit of the Charles Worthington Body Booster Mousse into my hand. I tend to aim for the size of a large pea because it really frothes up when it’s out of the can. I work this into the roots of my hair around the crown to aim to add a little bit more volume there. This product feels quite thick but works itself well into the hair which I really like, and I do notice a difference when I use it but don’t expect miracle results. From here I continue drying for a little longer. I always dry my hair with my head upside down and move the dryer around in a few different directions, especially around my “fringe” as this is supposed to add more volume. 4 - Before my hair is totally dry I also sometimes like to add a little of the Di Palomo White Grape Dry Oil to the ends of my hair (here is the new version with aloe too!). I really want to try some Morccanoil but again, this is a little outside my price range right now, and so I’ve been using this instead. I hadn’t used much of this since I first I got it but I love the smell - it’s meant to be white grape but this is seriously one of my favourite smells ever. I just spray this once or twice onto my fingers, then rub my hands together and run it through the very ends of my hair (make sure it’s still pretty damp!). I tend to do this every other wash and my hair is definitely feeling softer than before, not to mention smelling gorgeous! I’ll have to be careful in the summer when the bees come out haha (do bees smell?!). 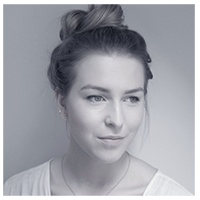 It is also worth mentioning that I have recently introduced another product into my hair routine which is the Original Tangle Teezer (which I have a full review on here> which I also think has contributed to my hair behaving a lot better too. There is a review on this coming up soon! Also, if you are interested in the hairdryer that I used there is a link to it here. I would be happy to do a post on this too if anybody is interested? Just ask! 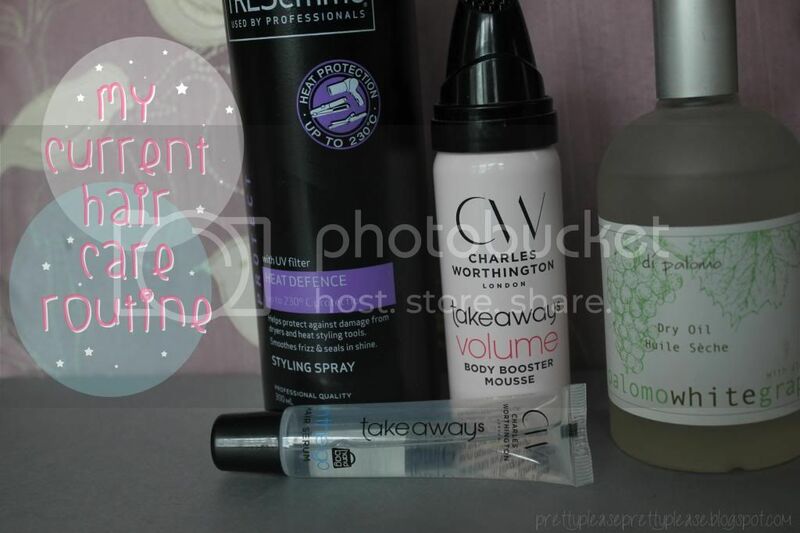 Using these products won’t necessarily be a game changer, but I find that they work well together and being on a budget I can’t really afford to try out all the latest holy grail hair whatevers. I hope that you have enjoyed today’s post. Do you have any hair products that you can recommend to me?? I've used the heat protection spray for years, it's amazing! My hair used to be fine too but then I stupidly dyed it all sorts of colours and it's ridiculously frizzy now! I've been growing my natural hair colour out since August! aah! I've also used the Tresemme heat defense for years, I really like it. I really need to try that heat protection spray, i've heard so many good things but somehow just haven't got round to it yet! Ooh I hadn't really thought about the smell, I'll have to give my hair a sniff next time I use it!